Plant Environment: Require a least 6 hours of strong sun and well drained soils. Good air circulation helps prevent any foliar diseases so don’t overcrowd plantings. Plant Bloom: Wide array of colors available in red, pinks, peach and white. A total of six different varieties are currently available on the market. 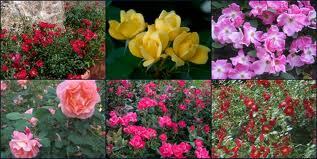 This new family of roses is a hybrid cross between full size groundcover roses and miniature roses. Promoted for their continuous blooming, starting in late spring until fall frost they are well suited for areas that need a colorful accent. These are low maintenance roses in regards to spraying and pruning. The foliage is disease resistant and they require a single hard spring pruning (cut back 6-8″ to the ground) for them to flourish in the landscape. Rose fertilizer applied several times during the growing season would encourage more prolific blooming.